Boy, am I tardy to the party with this one. I've heard pleanty of good things about Rainbow Rowell's books for quite some time around the blogosphere and over on BookTube so I decided to give her stuff a try since I've been craving some good contemporaries (although this isn't technically contemporary because it takes place in the 80's) for a while now. I went into the book hoping to really enjoy Eleanor & Park and finished it initially having good feelings that then went a little downhill once I started to think about it. Eleanor & Park tells the story of two teenagers in 1980's Omaha, Nebraska (birthplace of Marlon Brando, the greatest actor in history, and not a single mention of him. Shameful.) named, well, Eleanor and Park, respectively. Eleanor is the new girl in town and considered to be a bit of a weirdo due to her appearance: bright red curly hair and clothes from Goodwill that are falling apart. Park is the quiet guy who is acquainted with most people but still manages to keep to himself and meets Eleanor on her first day when he has her sit next to him on the bus to save her from embarrassment. Over time they go from being strangers, to being sort of friends, to being in love. This was an issue that I had with the story. I was glad that the book wasn't going with the whole 'love at first sight' thing because I don't think that even happens in real life, but the way that the book progressed made it look like Eleanor and Park barely had any time to get to know each other. I would've liked to have been able to see the time in which they became friends, rather than jumping straight to the hand holding, which felt a little awkward. I can see the comfort in having someone hold your hand, but it's not that big of a deal. Pushing that to the side though, I did enjoy how light the story was and how it could be both heart-warming and heartbreaking at times, as first love stories often tend to be. 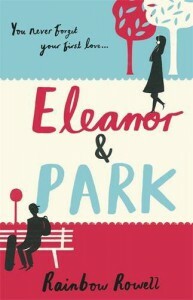 My biggest issue with this book was Eleanor. I liked her at the start, but as the book went on, she just started to get on my nerves. I understand that people can be insecure about how they look, because I'm a pretty insecure person too, but Eleanor was so insecure it was just frustrating. She would take a compliment that Park would give her and then twist it into an insult and that's just not cool. I don't think there was any character in the entire book who bugged me as much as Eleanor did and that's what dragged the book down for me. There were plenty of times I wanted to either slap her across the face and tell her to pull herself together, or just wanted her to be quiet and stop being so ridiculous. Seriously, if you feel a need to change parts of yourself so that the person you like will like you back, they're the problem not you. However, in between being frustrated by her insecurity, I did genuinely feel sorry for Eleanor because I could empathise with her at certain times, specifically when she was being bullied at school. Park, on the other hand, didn't really strike me as anything. He wasn't a particularly interesting person, but he wasn't completely boring either. He was just... meh. I didn't really think much of him in any kind of way. Not as somebody I'd want to be friends with, and not as somebody I'd want to be romantically involved with either. Nothing really made me like him. He reads comic books? That's cool, I guess. He has a big music collection? Good for him. I didn't even find him particularly romantic, and honestly, the whole 'girl who isn't conventionally pretty is perfect to me and that's all that matters' thing was never something I was into. It's nice and all, but it's sickly sweet to me. Eleanor and Park is told from the perspectives of both Eleanor and Park, which I didn't really mind but I found it odd that both of the POVs were narrated in the third person. At times it didn't feel like the POV had changed at all and I had to flick back a couple of pages to see who's perspective I was reading a scene from. However, I did like the writing style which really managed to capture the feeling of being in love for the very first time and all the little things about the other person that makes your heart flutter and butterflies go crazy in your stomach. I had originally given Eleanor & Park four stars, but as I was writing this review I changed my mind and decided to give it three instead. Eleanor just got on my nerves so much and that's not a good thing, considering the fact that she's a main character. That aside, I did like the book and managed to get through it pretty fast and enjoyed the story, although I wish I could have liked it more.